Nigeria's Zannah Mustapha Honored By U.N. For Helping Kids Caught Up In Boko Haram Conflicts : Goats and Soda Nigerian lawyer Zannah Mustapha is honored this week for negotiating the release of girls captured by Boko Haram and starting a school for orphans and others affected by the violence. 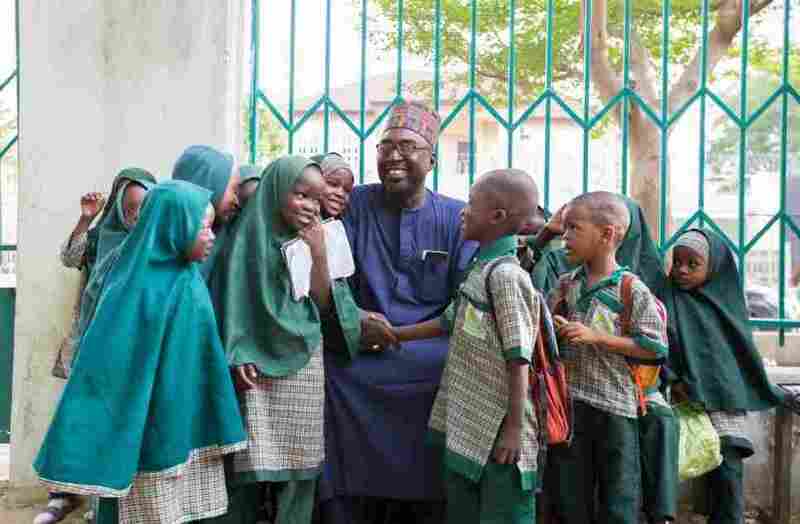 Zannah Mustapha and the students of the Future Prowess School he founded for children caught up in the Boko Haram conflict. This week he won a U.N. prize for his efforts. 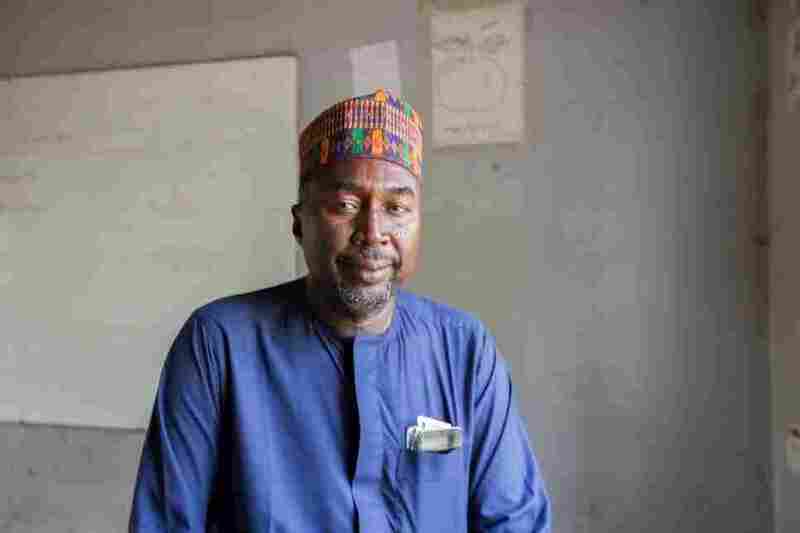 "Once upon a time, I was a child," says Zannah Mustapha. And a fortunate one, at that, adds the 58-year-old Nigerian lawyer. This is not the case for many young people today in his city of Maiduguri, the capital of Nigeria's Borno State — and the epicenter of the Boko Haram insurgency. An estimated 1 million kids have been displaced, and too many of them have lost their parents to violence. Mustapha's response? "I have to protect them." On Monday, Mustapha was honored in Geneva with the U.N. Refugee Agency's Nansen Refugee Award in recognition of the school he founded — which now enrolls 540 needy children from families on both sides of the conflict — and for his ongoing efforts as a mediator. "The work Mustapha and his team are doing is of the utmost importance, helping to foster peaceful coexistence and rebuild communities in northeastern Nigeria," the U.N. High Commissioner for Refugees Filippo Grandi said in a press release. Mustapha's ability to negotiate with leaders of the Boko Haram terror group has already helped secure the release of 103 kidnapped Chibok schoolgirls. The seeds of these successes were planted a decade ago, when Mustapha created the Future Prowess Islamic Foundation School in February 2007 to serve orphans and the poor. Children from ages 3 to 8 attend. "What happened is we started teaching in my own house," he says. There was just one teacher for that first class of 36 students. They have since gone on to graduate from secondary school and enter university, Mustapha proudly notes. Initially, Mustapha personally funded the project. He's since turned to additional donors and volunteers to help keep it going. Demand grew sharply after the 2009 Boko Haram uprising. In the aftermath, Mustapha says, "children were cast out on the street." No matter whether they were the kids of Boko Haram fighters, Nigerian security forces or others, their education was at risk. Mustapha also recognized the needs of women who had been turned into widows. "When a husband dies, almost all wives are as vulnerable as orphans because they don't have any livelihood," he says. Mustapha sits in a classroom at the school he set up — Future Prowess Islamic Foundation School — in Maiduguri, Borno State, Nigeria. So the scope of the school widened. To ensure kids weren't coming to class on empty stomachs, a free meal program was introduced. Students also started receiving free clothes and health care. Widows, many of whose children attend the school, were invited to join an associated cooperative that offers free psychotherapy and training programs to help them get back on their feet. They're taught to make products, such as soap, shoes, jewelry, clothes and food, to be sold at local markets. These mothers, and other family members, have played a key role in shaping how Future Prowess operates. All decisions — including what the kids study, wear and eat — are made through a collaborative process. In the conflict, these families may be on opposing sides, but at the school, there is a single, unified front. "We put inclusiveness in every aspect of what we do," explains Mustapha, who credits this strategy with keeping his students safe. Although more than half of the schools in Borno have been shuttered, as UNICEF reported last week, Mustapha says there's never been a threat to Future Prowess. No wonder Mustapha thinks conflict resolution is one of the most important skills in the curriculum. At Future Prowess, he says, kids learn about accommodating others — even if they come from different backgrounds. "It has greatly enhanced the school, because the children are integrated," he adds. To him, it's one big family. "I feel these students are like my brother's children." Mustapha has enrolled his own kids at Future Prowess and asks volunteers to do the same. Despite how much Mustapha has already accomplished, he's hoping to do more. He's recently established another program for teenagers who missed out on the chance to go to school when they were younger. "What do we do with these students? Put them in primary school? Or secondary school? So now we are trying a livelihood training center," he says. Mustapha has also donated one-third of his family's farmland to displaced people. "When places were taken over by the insurgents, they had to run, and they came here," he says. "I felt I didn't need that much land for me." And as for the $150,000 that comes with his U.N. award? Mustapha is happy to use it to help more children. Giving away his time and possessions, he says, hasn't been a difficult decision for Mustapha. "I have seen the extent of the damage — and the magnitude of war," he says.